These Cool Sneakers Will Look Great With Both Ethnic & Western Wear! If you’re someone who likes comfort just as much you like to be stylish, these shoes will give you major heart eyes! 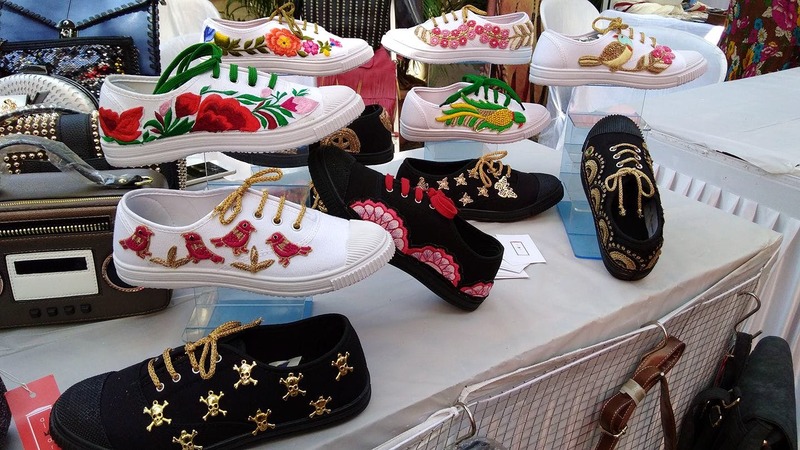 Almari - The Urban Closet is a brand that creates beautiful and unique, hand-embroidered sneakers. While some have dainty flowers woven on them, others are bold and blingy, with words such as ‘Pataka’ written on them. All designs come in two colours - on plain black sneakers or on white. The best part about the brand is that their designs are so pretty and versatile that they'd look great with both western and ethnic wear. Ever since Anand Ahuja made it cool, the fashion forward folks of the internet have made pairing sneakers with ethnic wear the new trend. Plus, if you’re someone who likes experimenting with your outfits, but at the same time, wouldn’t want to be caught wearing a sari with your running shoes, Almari's shoes are perfect. While we aren't a fan of their blingy options, we loved the ones that had flowers, and cat paws on them. Nonetheless, it's a brand that's surely worth checking out. They don't have a website yet. You'll have to follow their social media handles to place orders and stay up to date with their collection. They're open to customisations. So, if you have something specific in mind, feel free to let them know.